Train Rides and Safety | Toowoomba Live Steamers Inc.
Safety First … It is a mandatory Workplace Health and Safety requirement that any person who rides on our trains, MUST WEAR ENCLOSED FOOTWEAR. Riding and visiting miniature railways involves some RISKS to passengers and visitors to the railway. Miniature locomotives, particularly steam locomotives, are hot, dirty and smelly. They have hot fires inside them which drop hot ashes and emit smoke and soot. The hot fires are required to make hot steam, this steam can escape, in a controlled manner, albeit suddenly and noisily, from the side or top of a steam locomotive. Toowoomba Live Steamers and locomotive drivers will endeavor to minimise such risks by avoiding attending to their locomotive when persons are around, however this is not always possible nor feasible. There is an expectation that visitors to the railway will also minimise such risks to themselves and to Toowoomba Live Steamers members by keeping clear of locomotives. If they wish to have a closer look at a locomotive, by asking the driver before moving closer. Because of the prevalence of ashes, coal dust, oil and smoke, it is strongly recommended that ‘your finest clothes’ are not worn when visiting, and shoes be worn. On rare occasions carriages could be caused to derail off the rails (just like the big trains) and passengers could be dislodged off a moving carriage. Toowoomba Live Steamers endeavors to minimise such risks by ensuring that the track and passenger wagons are constructed and maintained to safe operating standards, and that the drivers are competent or appropriately trained and supervised. Such Codes of Practice are governed by the Australian Association of Live Steamers (AALS). There is an expectation that passengers will also minimise risks to themselves and to Toowoomba Live Steamers members by following some appropriate safety measures, particularly no sudden movements or leaner out or over when riding on a moving train. Should an incident occur on a moving train wearing enclosed footwear will help provide some protection from hitting the ground, carriage and/ or track. It is a mandatory Workplace Health and Safety requirement that any person who rides on our trains, MUST WEAR ENCLOSED FOOTWEAR. Shoes, sneakers, runners etc are suitable. 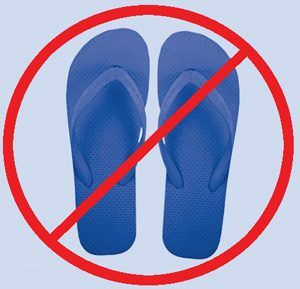 Enclosed footwear does not include THONGS, SANDALS OR BARE FEET. Sandals with strap/s around heels, or open at the front are NOT enclosed footwear. Passengers will not be permitted to ride without enclosed footwear. If an incident does occur and someone is injured, PLEASE report this to the TLS person at the Ticket Sales Table at the Station. If you or any one else requires some assistance, there is a stocked First Aid Kit at the Ticket Sales Table available for use if required. Trains are unable to stop quickly. Always walk well clear from the tracks and cross the train tracks at the proper marked crossings and look out for approaching trains. DO NOT run beside the trains when they are moving. You can trip into the path of an approaching train. With both feet straddling the passenger wagon sit down onto the wagon seat and place each foot onto (or inside) the passenger wagon. ALL Passengers must be seated. Carrying babies in arms is not permitted. Passengers feet MUST at all times be within the foot wells of the carriage. Passengers MUST NOT lean or reach out from the train to grab any plants, rocks, hats, signals, etc; as this may cause your carriage to derail off the tracks. If you fall and have a limb, foot or hand underneath the train it could cause you some serious bodily harm. DO NOT use cameras whilst the trains are moving. This includes still cameras, video cameras and mobile phones with built-in cameras. Smoking is NOT permitted on trains. Alcohol is NOT permitted on trains. Consuming food or drinks is NOT permitted on trains. Toowoomba Live Steamers Inc. reserves the right to deny admission onto the trains, to halt a train, to ask you to get off the train, or ask you to leave the site. This will apply to any person who may be causing a safety hazard or endangering others.